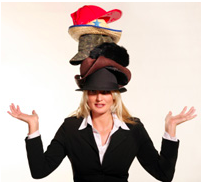 Wearing all the hats when getting your business going can become very tiresome…..ok exhausting!! But knowing what to outsource first can be equally confusing. When I launched my first handbag line, I was doing it all from designing, running my production, sales, shipping, trying to do marketing but failing miserably, and managing my other company which was supporting me and the bag business! When I finally started to make a bit of money and had consistent orders coming in, I decided that hiring out shipping was my best bet. They didn't need to know anything about the handbag business and if they were able bodied, could take a load off that was bogging me down. Since I wasn't big enough to move to a third party warehouse, I hired a young college guy part time. I felt so free……honestly I got back about 16 hours a week that I'd spent packing boxes and could actually do things to bring in more money like sales! I ask my Entreprenette Experts to give their 2 cents on what to outsource first to make your company a mean selling machine! Check out their responses below and let me know your thoughts. What are you planning to outsource first? You presented alternatives that I had not considered. Also – great tip for outsourcing HR so that you don’t get in trouble – also, good for payroll as well (even if you’re just paying yourself a salary from your coporation. They file everything for you and keep you out of trouble. Great article. Thanks for including me. Hope it is useful for folks. I have to agree that you have to figure out what things that you need to focus on and set aside the things that could be done by someone else that takes a lot of your time. Time is worth more than money. You need to budget your time wisely and be productive. Spending a little money in order for you to save more makes perfect sense. Outsourcing can surely make you save money but even though there are lots of benefits of it, I have to admit that there are also some disadvantages. One example is there’s no way to be sure if the person you’ve hired will do the best job. Unless you have an effective hiring strategy that’ll give you assurance then there’s nothing left to do but trust him and hope for the best results. Worth a read! I think this article explains the Outsourcing concept in voice of common people.